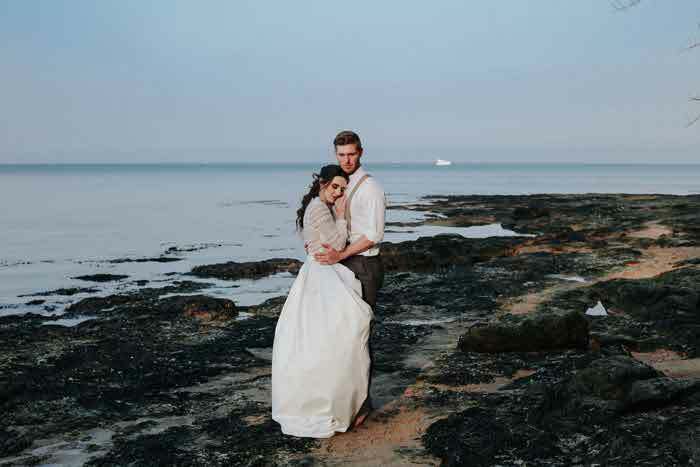 Sharing the details of this shoot fulfilled by Dorset-based suppliers, Natasha Gilchrist (Tasha Mae Wedding Co-ordinator) and Sam Savage (South Coast Weddings) discuss all the elements of this 1940s-inspired wedding set-up and recite the love story behind the pictures. 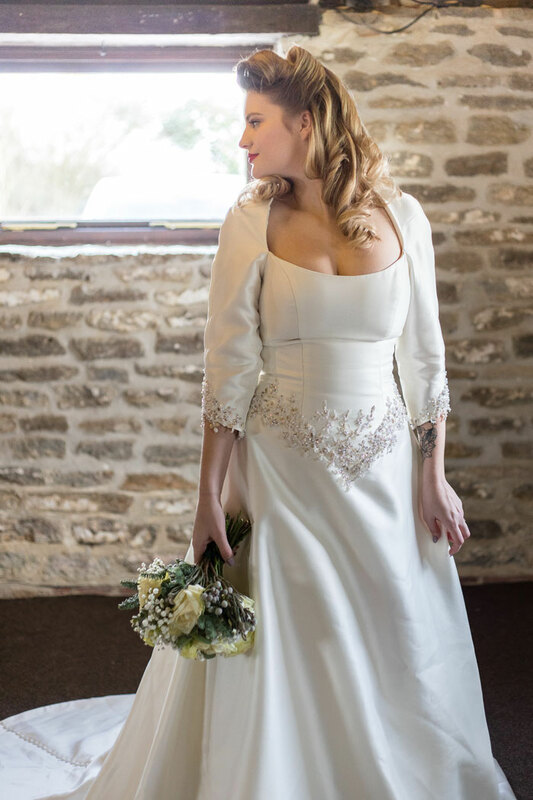 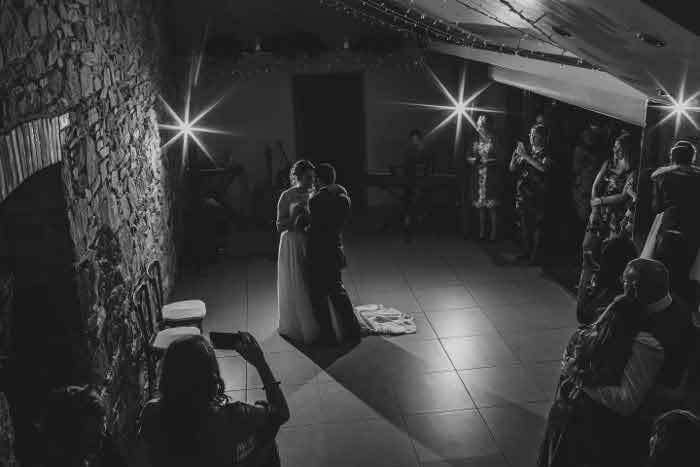 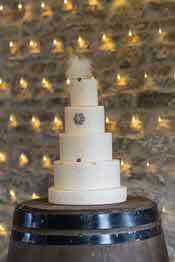 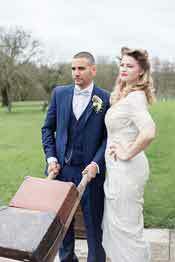 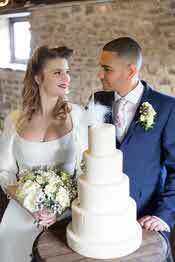 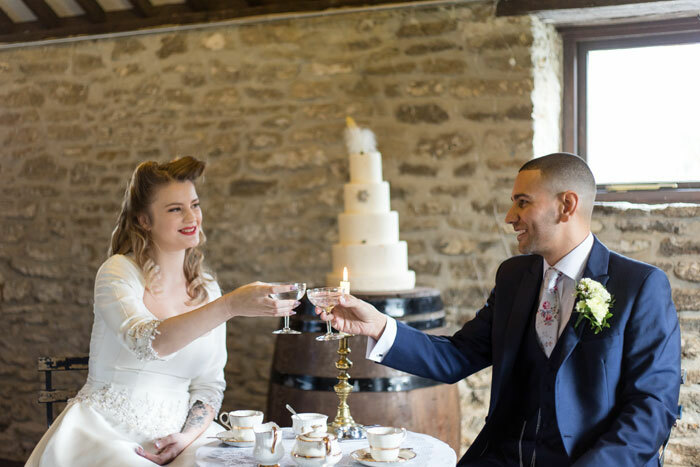 This 1940s inspired wedding shoot took place at The Old Milking Parlour at Cavokay House in Henstridge, Somerset. 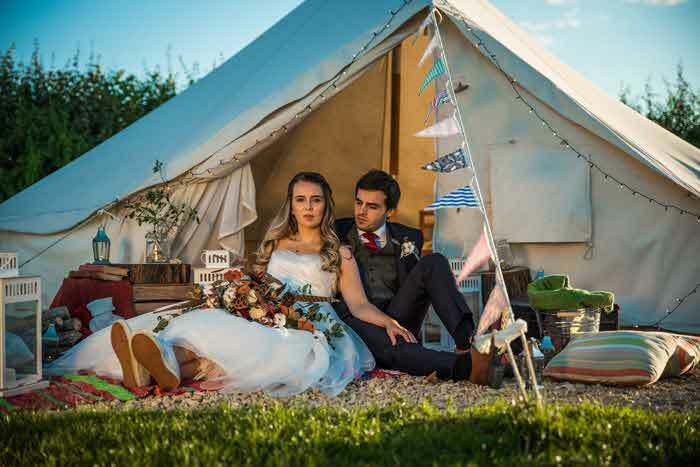 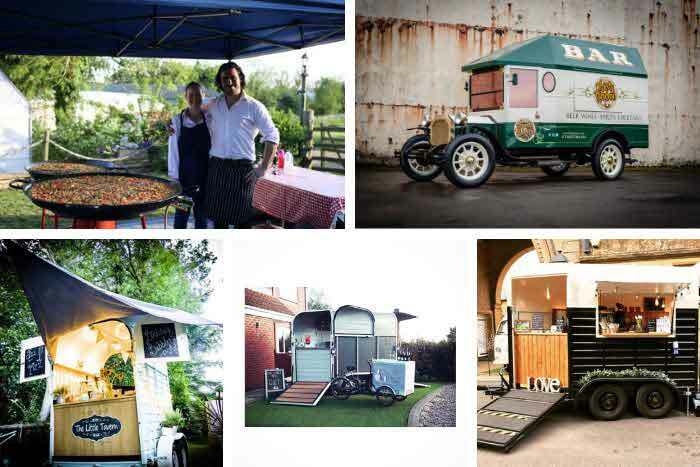 With this D.I.Y venue retaining its rustic charm and set in 12 twelve acres of private grounds, it seemed the perfect venue to hold our shoot. 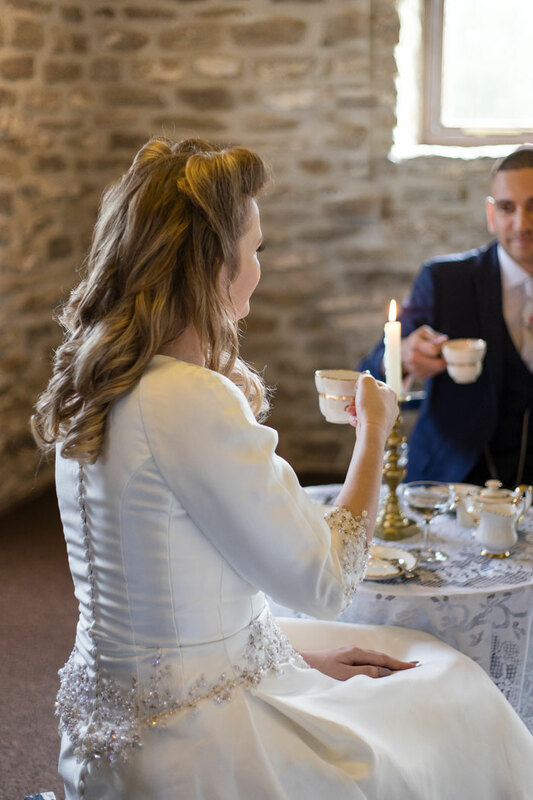 The idea for this shoot came about after we went to visit Lou and Colin, owners of The Old Milking Parlour at Cakovay House. 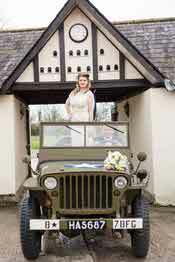 During their conversation Lou and Colin spoke of their original 1943 Willies Jeep, which they lovingly called ‘Little Bo Jeep’. 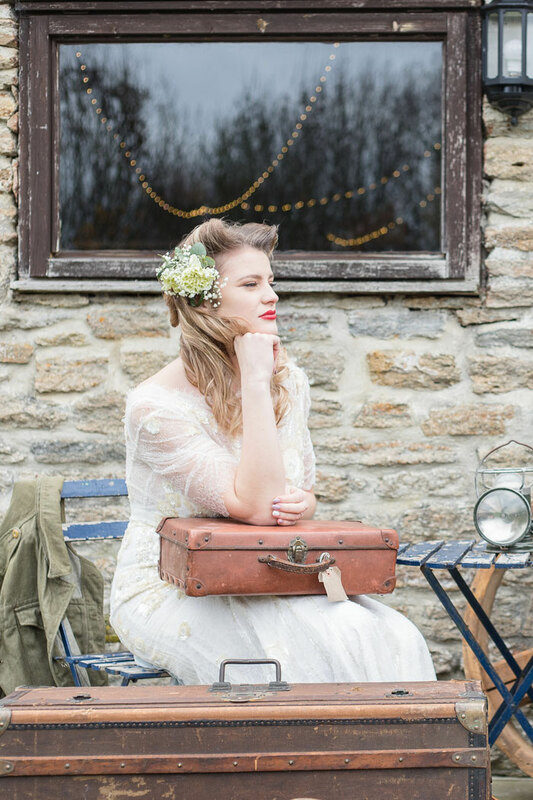 From this, the concept of the 1940s styled shoot began. 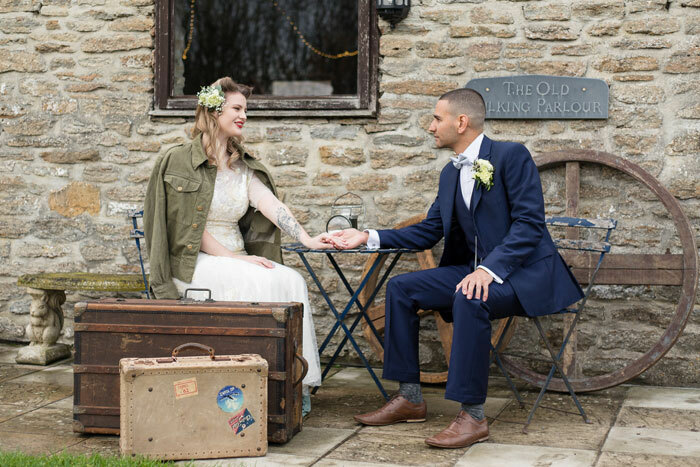 With the 1940s signifying an era of true love, the aim of this shoot was to tell a love story through the photographs which were taken by Stephanie Atkins Photography. 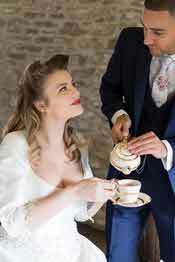 The story begins with the now married couple enjoying a romantic tea for two. 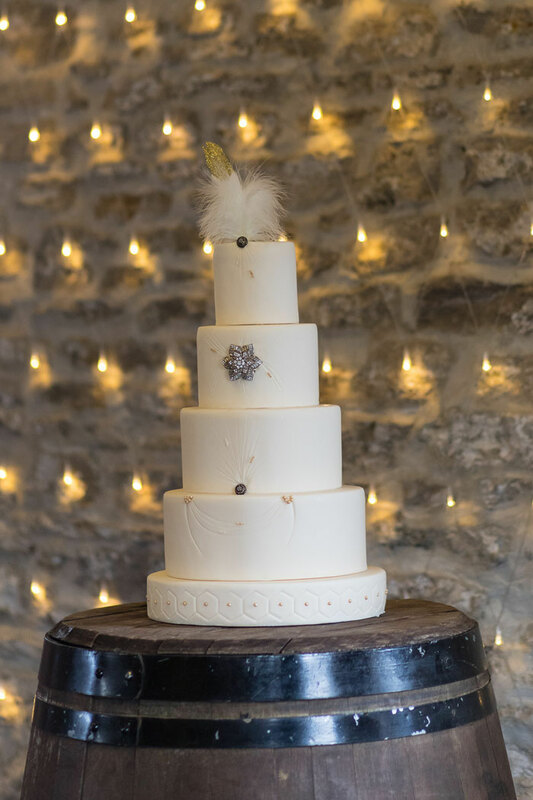 Our bride and groom models, Courtney Vines and Ross Okoye, from Ages Apparel, enjoyed their celebratory tea, using china from Swingletree Vintage next to their traditional styled wedding cake made by Mon Bel Amour Cake Craft. 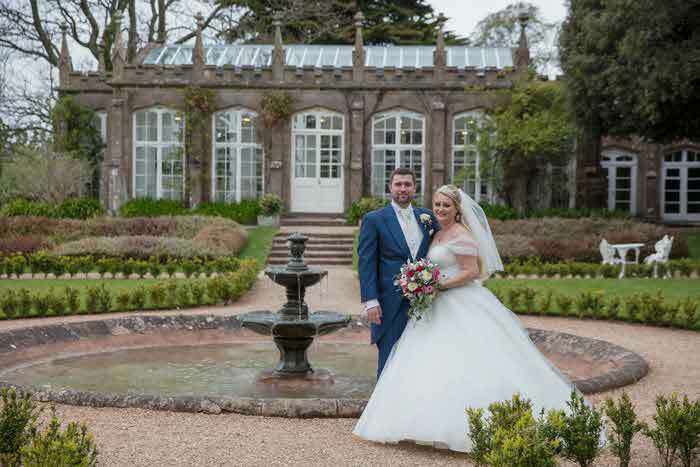 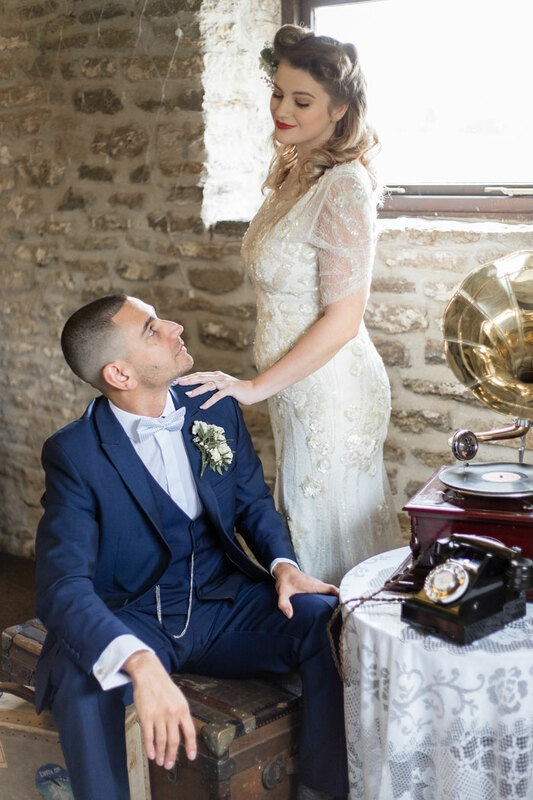 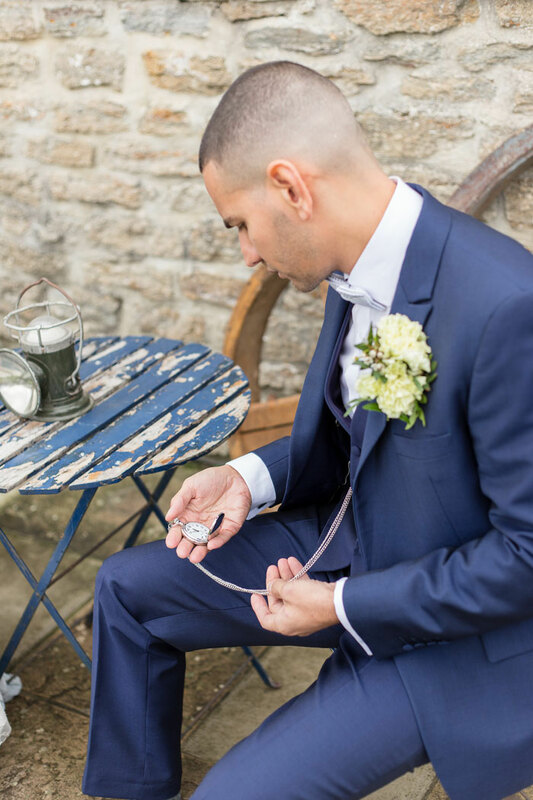 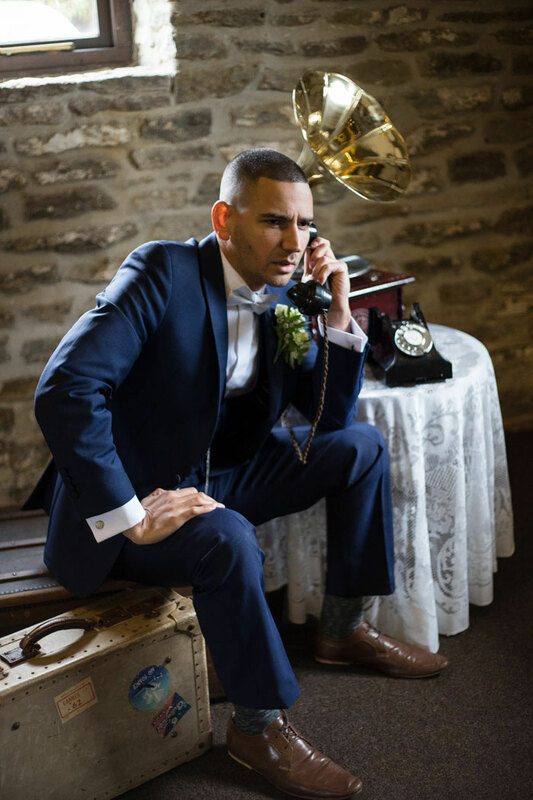 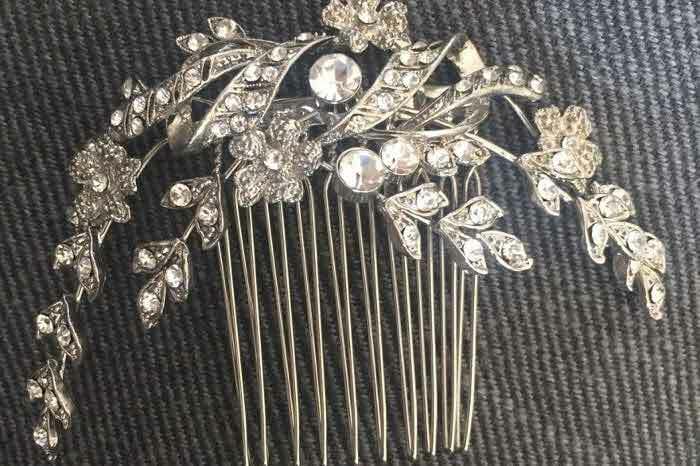 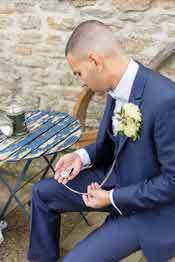 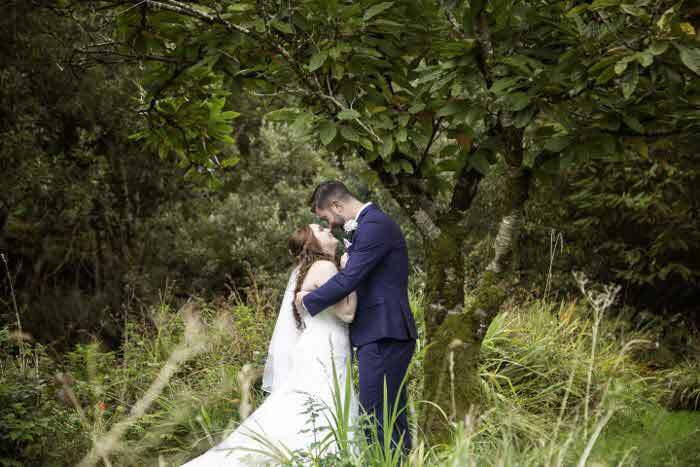 With the exquisite dresses from Bridal Reloved, Dorchester and a tailored three-piece suit from Wedding Time Bridal Salon and Men’s Formalwear, the two of them suited the 1940s style perfectly. 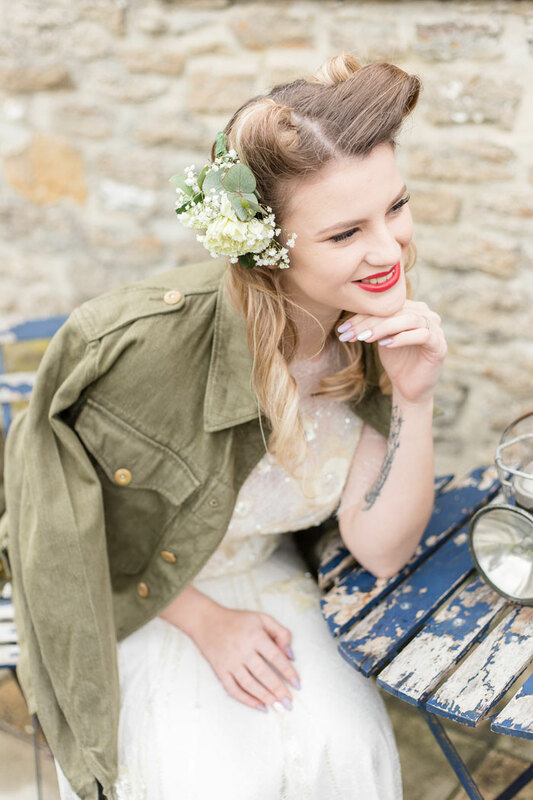 Courtney’s classic victory roll hairstyle, created by Bournemouth Bridal Hair and Make Up, finished the perfect 40s look. 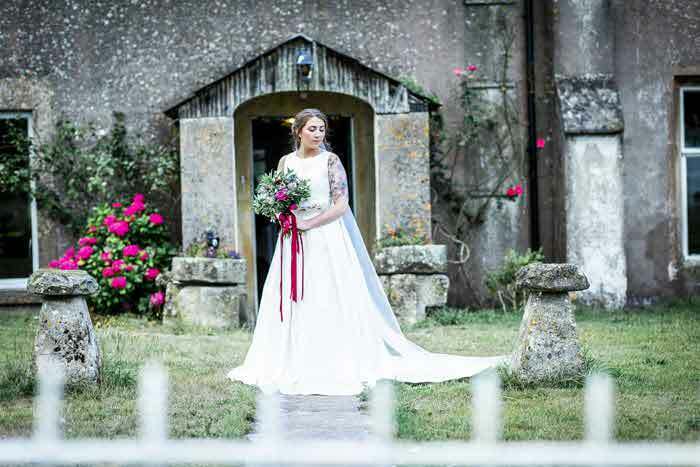 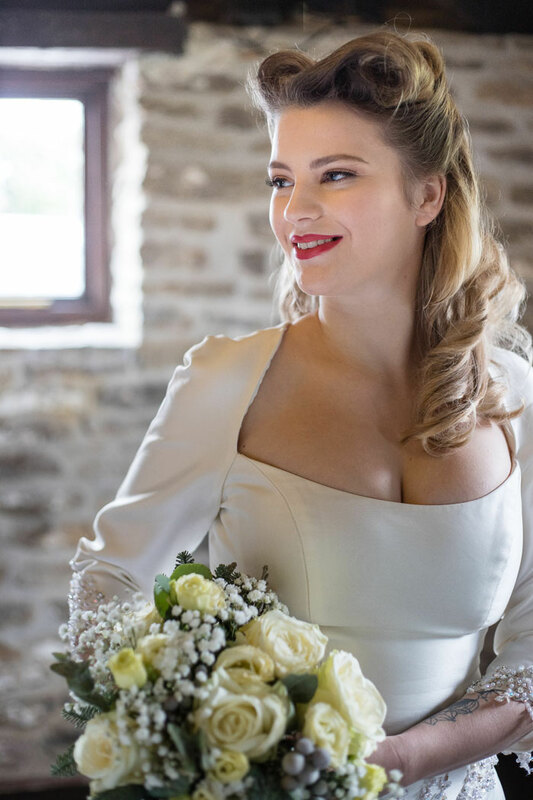 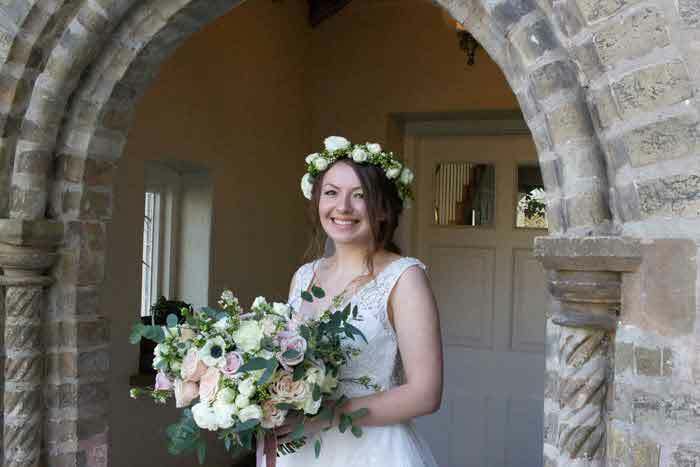 Taking in every magical moment of her wedding day, our bride had a minute to herself holding a beautiful bouquet created by Tilly’s Flowers using cream roses and carnations. 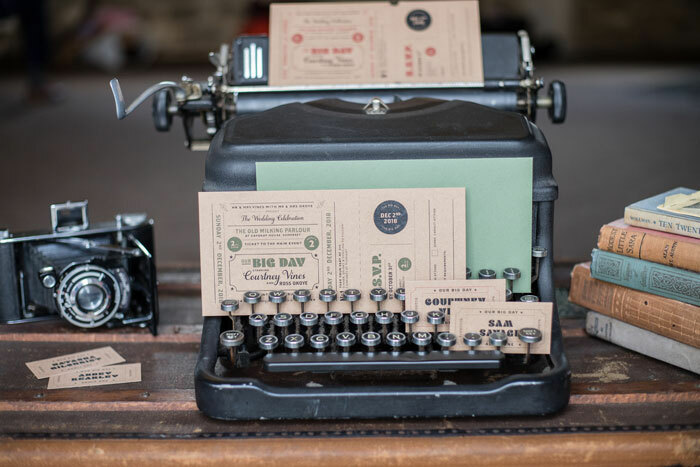 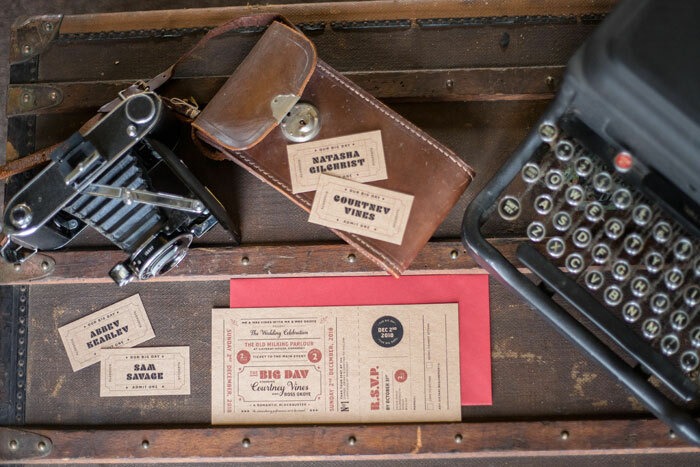 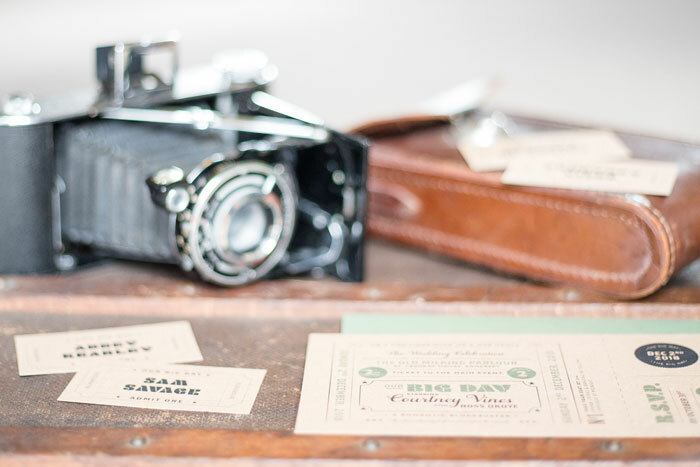 Incorporating a 1940s inspired wedding stationery set, expertly designed by Sophie Amelia Designs, helped create the 1940s feeling we were going for. Displaying it on classic vintage props, supplied by Swingletree Vintage, really brought it into its own, and showed the stationery off beautifully. 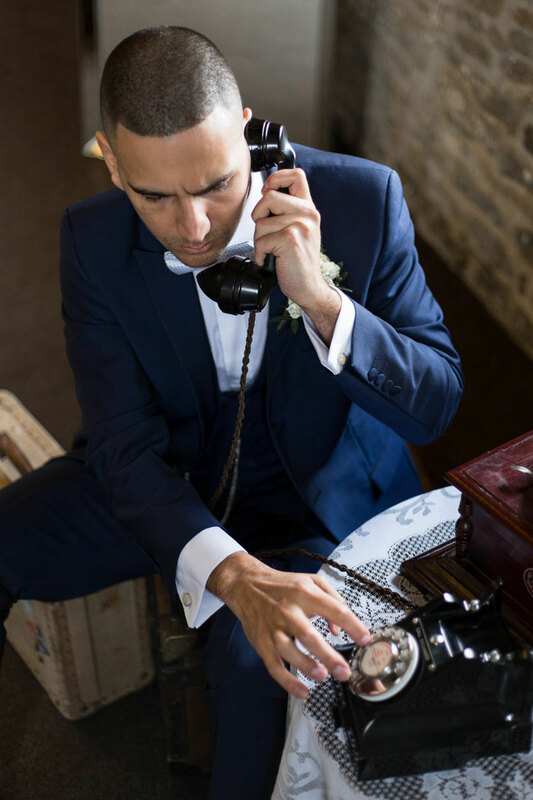 After finishing their tea, it was time for the groom to call for their car to collect them, once again using traditional vintage props to set the scene. 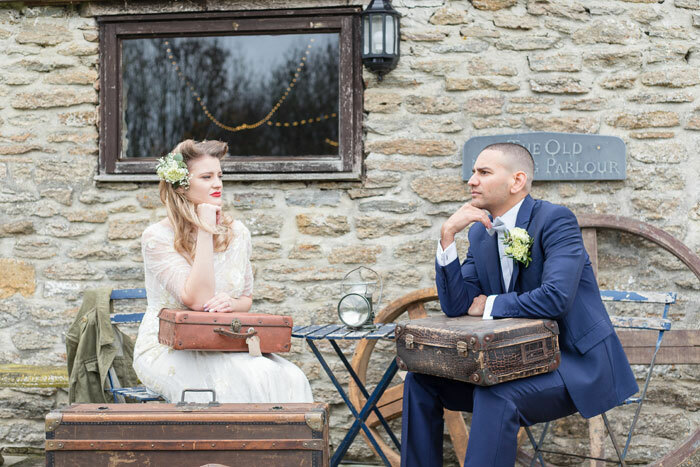 Waiting outside for their lift the bride and groom took a seat on a rustic bistro set complemented by brocante vintage props, all supplied by Oakland Collectibles. 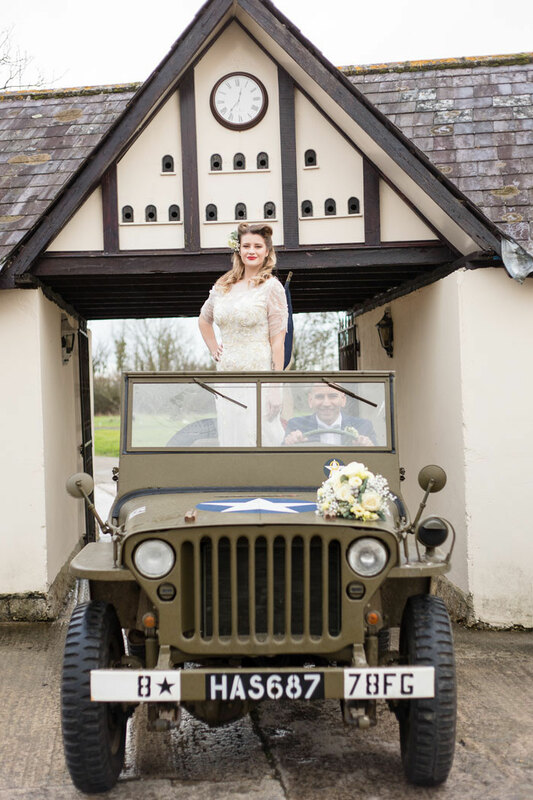 Keen to get going and start their married lives together, they became a little fed up wondering where their lift was – you never keep a lady waiting, after all. 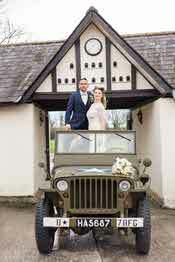 Eventually their car ‘Little Bo Jeep’ arrived and our model wedding photographer, George Okoye, also wearing a Wedding Time Bridal Salon and Men’s Formalwear suit captured a few photographs of them wheeling their luggage to the car. 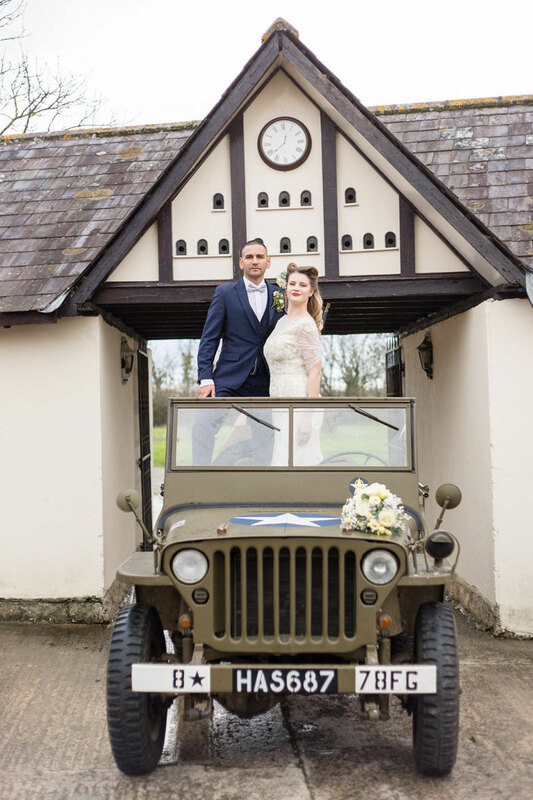 A day they had only dreamt of, while waiting for the war to end, had finally come true, as they headed off to enjoy a happy future and married life together. 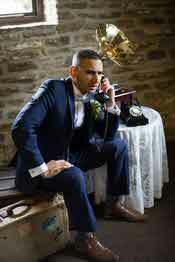 Telling our story with stills was fantastic but we also wanted to capture all the live moments of the shoot. 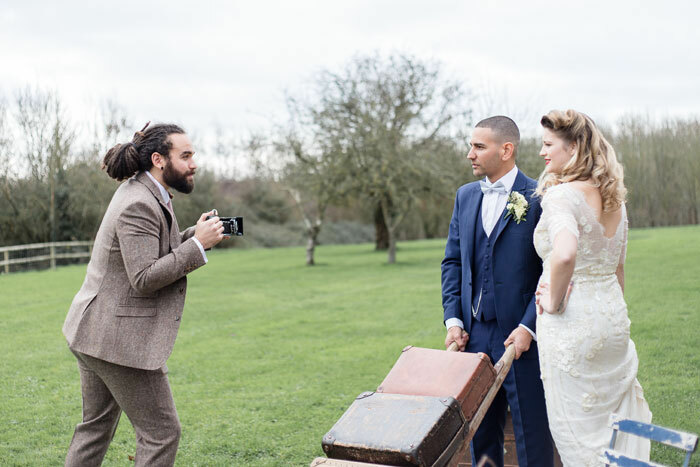 This is where the talented Thompson Wedding Films stepped in and produced a first-class video to bring our 1940s shoot to life. 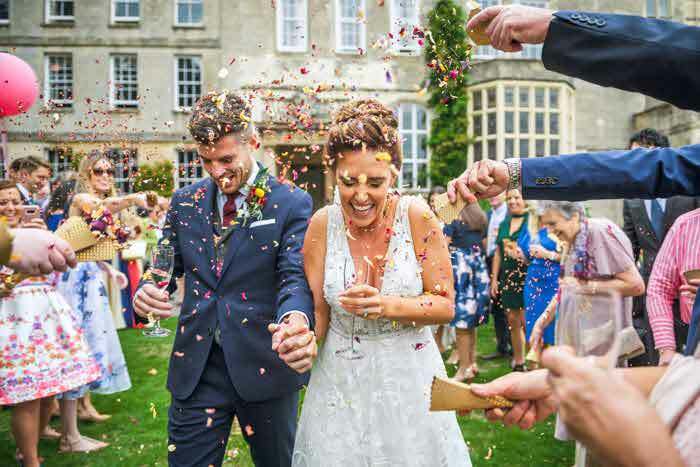 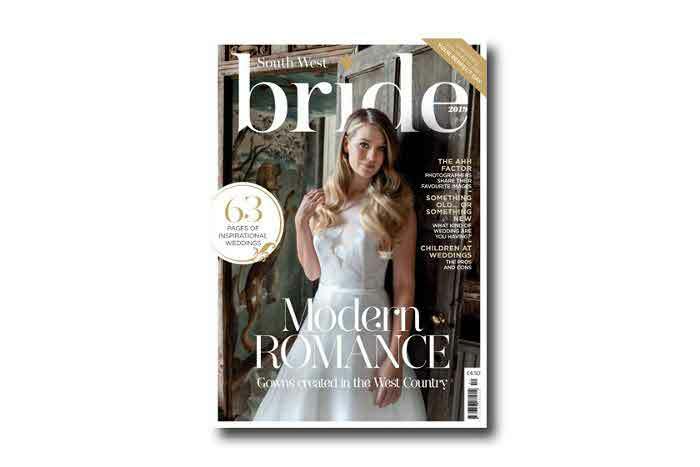 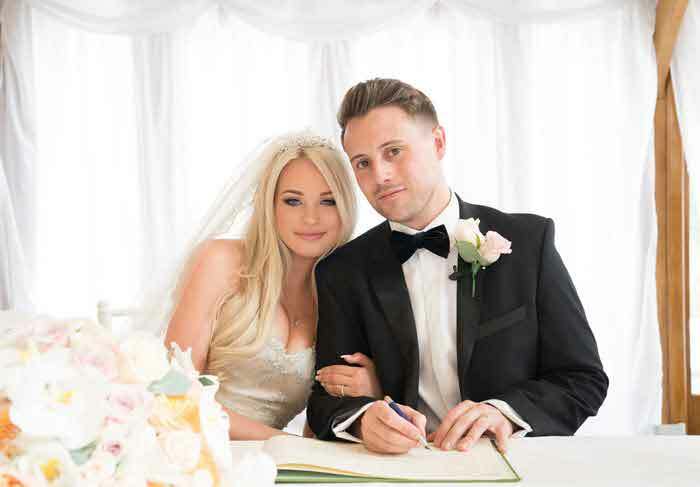 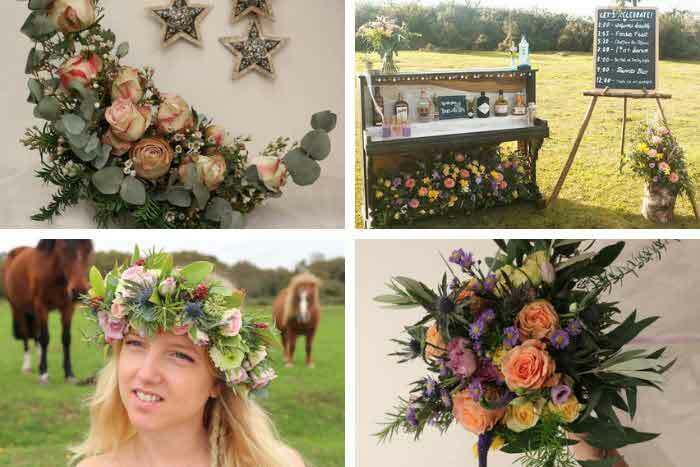 For more South West wedding inspiration, pick up the latest edition of South West Bride magazine.